Carrie Bader counsels clients involved in complex IP matters on all aspects of litigation. She focuses her practice on litigation of patent, copyright, and trade secret cases. In addition, she handles all aspects of trademark law, including trademark selection, clearance, prosecution, enforcement, and defense. 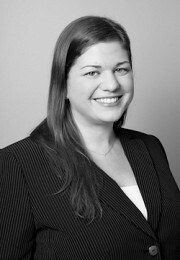 Her practice includes counseling clients on issues such as service marks, trade names, trade dress, search clearance, prosecution, licenses, assignments, releases, and other trademark-related protection and disputes. Her depth of experience in litigation spans discovery, depositions, case management, oral arguments, settlement, dispositive motions, trial, and arbitration. She has served clients in a wide range of industries, including video games, toys, wearable technology, GPS, telecommunications, and consumer products. Carrie’s experience prior to joining Erise IP includes a clerkship with Justice Carol Beier at the Kansas Supreme Court. In addition, her background includes working in the area of complex litigation, focusing on toxic torts and class action. Carrie graduated from the University of Kansas, School of Law where she was editor-in-chief of the Kansas Journal of Law and Public Policy. Carrie also served on the Moot Court Council where she competed in the final round of the ELSA International Trade Law Moot Court Competition in Taipei, Taiwan, in May 2009. Before entering law school, Carrie worked as a paralegal in litigation. She earned her B.A. in Cinema-Television from the University of Southern California in 2001 and lived in Los Angeles for several years before returning to her hometown of Kansas City.